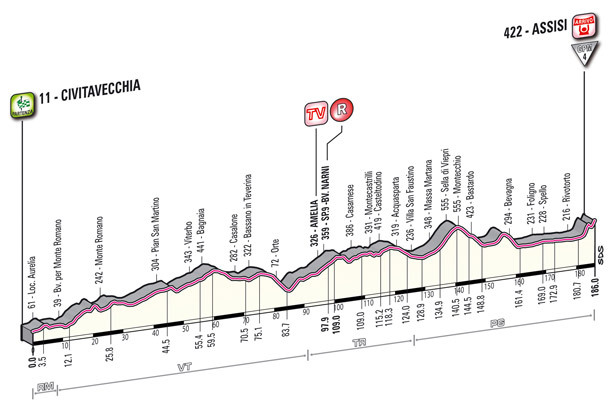 Today looks to be all about the finish in Assisi. The graphic above shows 15% sections, medieval archways and cobbles. Even if the riders rode up one by won this would look good on TV. But if there’s a bunch heading for the final ramps then expect a fierce battle. In truth the whole day is hard work, 186km of slogging across undulating terrain. There’s something about Italian roads compared to France or Spain in that you never know what is around the corner. The terrain is unpredictable and the roads twist and turn so much that the headset is a vital, if still forgotten, component on the bike. There’s every chance a breakaway goes away but even greater odds that it gets chased down because several teams want to control the race. If riders go get away we will need to see some big engines in the escape if it is to stay away. Assisi is an important place in Italy. A small town by population or geography it is a Unesco world heritage site and a tourist bonanza as well as a more pious site of pilgrimage. The Giro will tilt to the more popular and commercial imperatives but the town was located on a hilltop for strategic reasons, allowing the occupiers a chance to defend against marauders through the centuries. 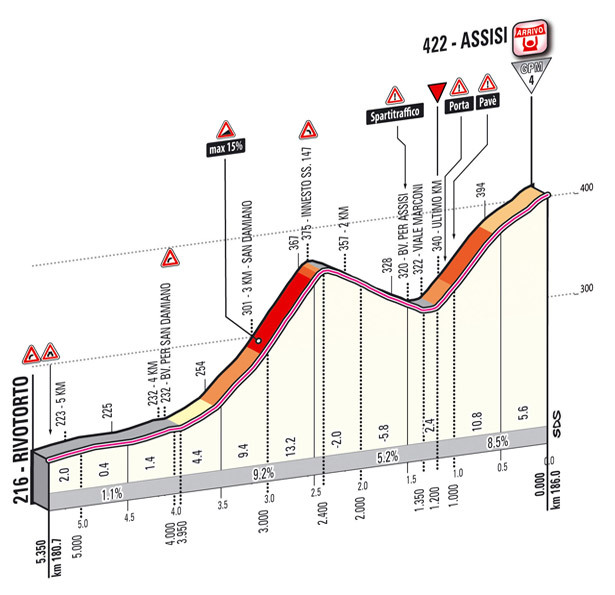 It is the same for the race today, if you are in the lead on the climb then you have the advantage. But just like an approaching army tackling the slopes, nobody really wants to be in the front line, better to let someone in front take the arrow, catch the boiling oil or today, feel the lactic acid. Like the Flèche Wallonne in April it pays to attack first but as late as possible. Indeed the winner back in April, Joaquim Rodriguez, is the big favourite for today. But expect others to challenge given the prestige and time bonuses available. Enrico Gasparotto is another from April worth watching, as is his team mate Paolo Tiralongo and Michele Scarponi is hunting for time bonuses too. And last year when everyone thought he might strike in the high mountains John Gadret won a stage with a similar uphill finish. Either way tune in, the finish is expected around 5.00pm Euro time. Excited about this stage, watched a video of the finish on youtube yesterday and it is certainly beautiful. Think the bookies may have it right today, a J-Rod win looks on the cards. Seeing that Assisi profile, my first thought was “Rodriguez”, I really enjoyed his ultimately fruitless attack yesterday, while it may not have come to anything, he was willing to take a risk. That anyone in the top 15 could possibly win is just too thrilling to imagine! Rodriguez +1. Missed yesterdays finish, will not miss todays. The stage finish looks amazing! Hoping for Pippo to make up for yesterday and go for the win. Pippo is out with micro-fracture in the scaphoid.. Damn. Love his style so much. I wonder if that was why Rodriguez attacked on the hill yesterday, not to try and win yesterday but to test himself riding off the front of a fast moving peleton ready for today which finishes at the top of the hill with a very narrow approach as opposed yesterday when it flattened out? That finish looks absolutely incredible. Hats off to the Giro for doing something so audacious! It was a lovely five-kilometer race. Now we know a thing or two more about who can win the Giro. Hopefully this weekend we will be able to witness 20 km of good cycling.